Rufus' home world is a giant, planet-wide junkyard - and the Elder Council of Elysium just decided to blow it up. Only Goal, an off-world beauty can still prevent this, but she is stuck with Rufus on the Floating Black Market. He strives to leave the junk planet Deponia and reach the legendary floating city of Elysium. However, a flaming saw blade grounds Goal and Rufus on Deponia again. By accident, her consciousness gets split into three parts and stored to three different discs. Now it's on Rufus to convince all three parts of Goal to become one again, venture to Elysium with her and save Deponia from certain doom. 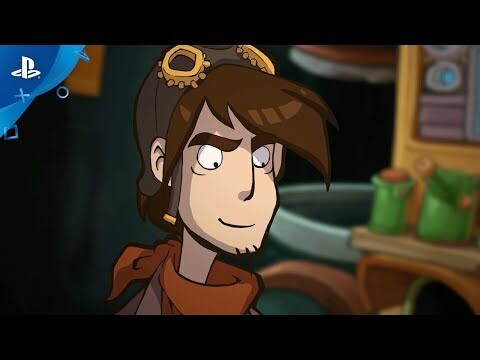 The second adventure on Deponia tells a unique story playable without further knowledge of the first installment. Fans of the first game will discover new aspects of familiar characters' backgrounds and see open questions answered.